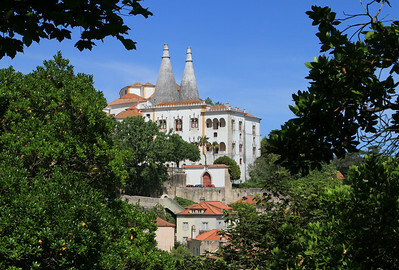 Palacio Nacional de Sintra, with large conical kitchen chimneys. 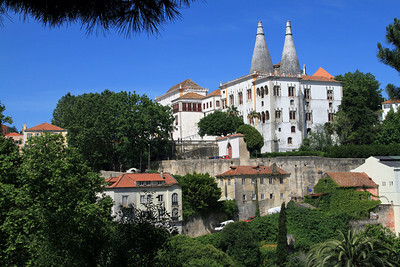 Teh kitchen chimneys of Palacio Nacional de Sintra. 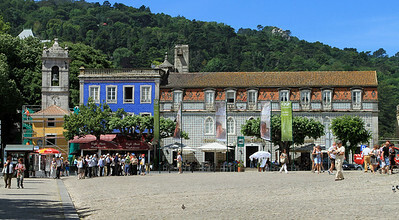 Palacio Nacional de Sintra, Sala dos Cisnes, the banqueting hall. 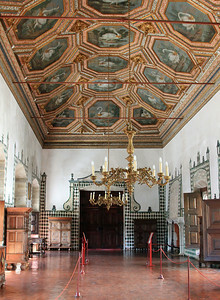 The ceiling was painted in the 17th century and is divided into octagonal panels decorated with swans (cisnes). 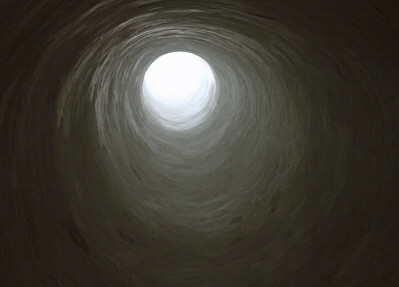 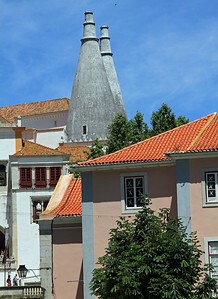 Palacio Nacional de Sintra, view up one of the kitchen chimneys. 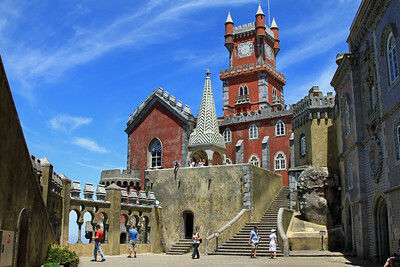 Palacio da Pena, Sintra - The chapel and courtyard. 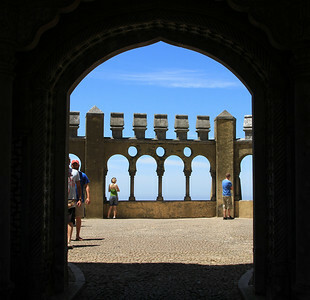 Palacio da Pena, Sintra -Entrance arch and palace. 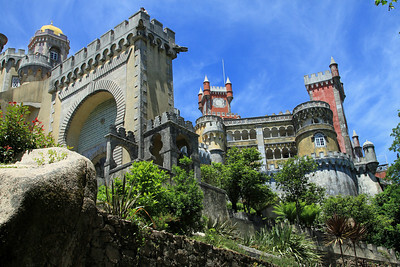 Palacio da Pena, Sintra - palace and clock tower above chapel. 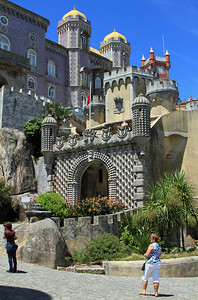 Palacio da Pena, Sintra - The entrance into the palace. 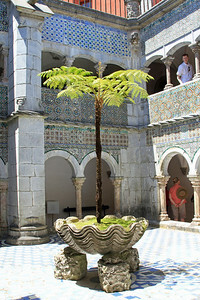 Palacio da Pena, Sintra - The courtyard outside the chapel. 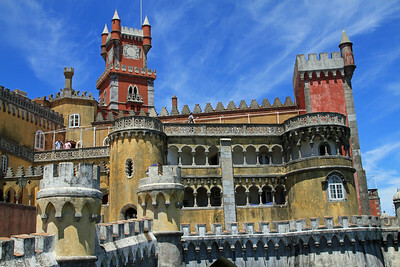 Palacio da Pena, Sintra - Central courtyard. 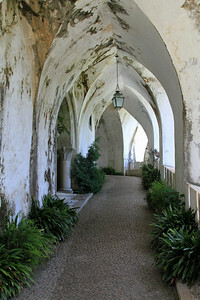 Palacio da Pena, Sintra - The entrance corridor into the palace. 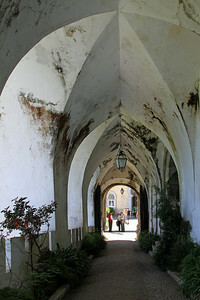 Palacio da Pena, Sintra - The entrance arch into the palace. 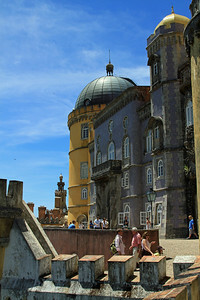 Palacio da Pena, Sintra - Outside courtyard and palace. 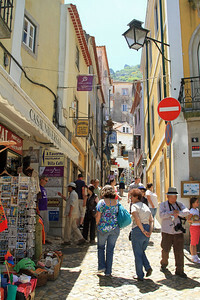 Shops and buildings outside the entrance to Palacio Nacional de Sintra. 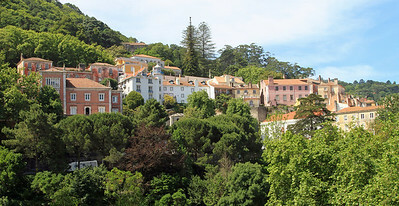 Houses in the old town of Sintra. 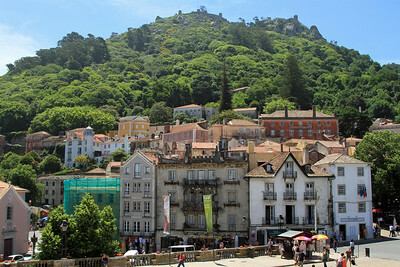 Old Sintra town, with Castelo dos Mouros (remains of 8th century Moorish castle) above. 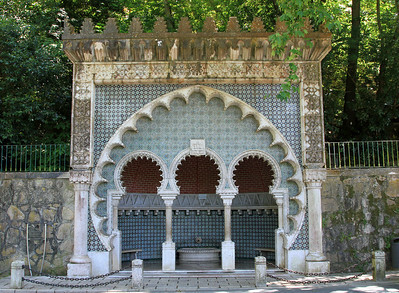 Fonte Mourisca (arab fountain), a drinking fountain named for its Neo-Moorish decorations, old Sintra. 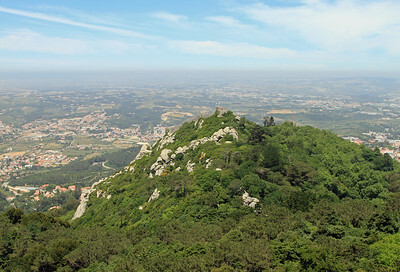 Hilltop above Sintra with the remains of Castelo dos Mouros, an old Moorish castle.